Change is inevitable. It is a constant that we can all be sure of. Many people thought - or were hoping - that the change accompanied with the turning of the calendar from 2012 would be drastic, catastrophic even. And while there were no collapsing cities, burning bridges, or major environmental events, change is afoot. It's a matter of where your attention is focused, and if you train your eyes on the people, you will quickly see that the awakening and transformation of humanity is alive and growing. As evidence, take a look at three popular movements that have begun to find a firmer footing with the shifting calendar: Occupy, the Zapatistas, and Idle No More. By now, most readers are familiar with the Occupy Movement that began with protests in Zuccotti Park in Manhattan that quickly spread to cities across the U.S. and around the globe. Occupy caused a ruckus at first, but it was characterized as unfocused and disorganized in the popular press, and appeared to lose some steam. It turned out to simply be a pause, as first, a coalition of Occupy groups began the Strike Debt campaign through which they are buying up debt and abolishing it. Then, in the aftermath of Hurricane Sandy, Occupy became one of the most effective aid organizations in New York City and surrounding areas. The new year is witness to a renewal and transformation within Occupy, from simply a group of protestors, to a group of protestors that are also fulfilling basic human needs. The turning of the calendar was also witness to the re-emergence of the Zapatistas in southern Mexico. Similar to Occupy, the Zapatistas never went away, and had continued working in communities throughout the region without much media attention. Starting on December 21, 2012, thousands of Zapatistas began marching in silence into five major cities: Palenque, Altamirano, Las Margaritas, Ocosingo, and San Cristóbal de las Casas, and occupied their central squares. 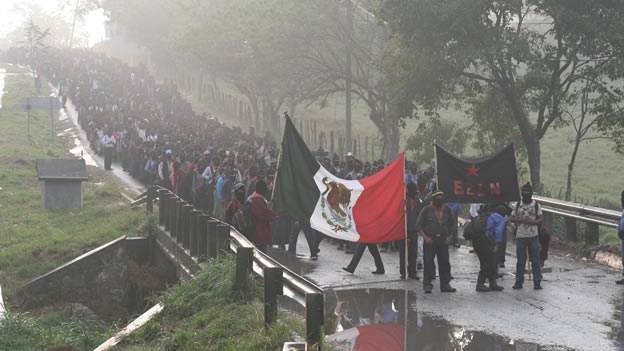 Their initial message was "that the Zapatistas are still here, in silence and with patience, like the water of the river that beats the sword…" They have since begun releasing a series of communiques announcing their next steps, which include among other things, the forging of links with resistance movements around the globe. One of those movements is Idle No More, which began as a protest by Canadian indigenous groups to Bill C-45, which gives more control of land and natural resources on Native peoples' lands to the Canadian government. Started by four women and a hunger strike, Idle No More has captured the attention and imagination of people across Canada and the world. Circle dances, flash mobs, railway blockades, and other forms of protest are being used to bring people together for an emerging common cause of protecting human rights, and bringing about government reform the world over. Idle No More is quick becoming the rallying cry for popular movements around the globe, and is just the latest evidence that humanity is indeed awakening to a new era. Welcome. Idle No More was just featured on Democracy Now! Add the recent protests in India, plus all the stuff going on in the Middle East, and this begins to look like a global phenomenon. And this moment in history is key since we have the global communication networks in place to actually connect all of these events. Exciting times! I like the note of positivity here. So much better than having images of falling off of cliffs hammered into your brain.